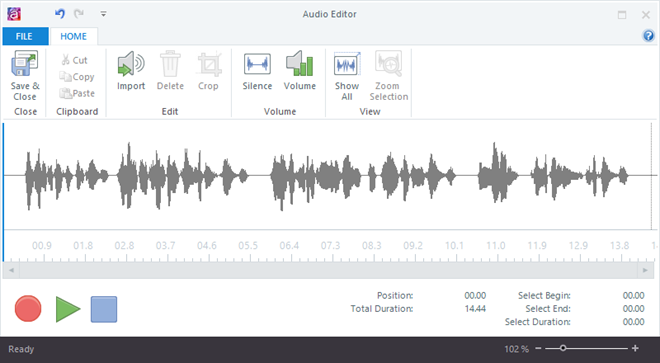 Articulate Storyline has a built-in audio editor with several tools for working with audio clips. You can record, import and export audio, delete mistakes, insert silence, adjust the volume, and more. 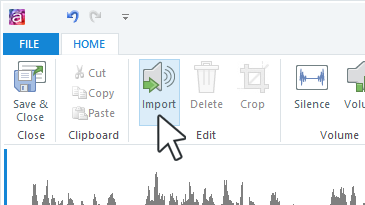 Right-click the audio icon at the lower left corner of your slide and select Audio Editor. Tip: If your slide has more than one audio clip and you aren't sure which one to select, double-click each audio icon to hear a preview of the audio clip it represents. 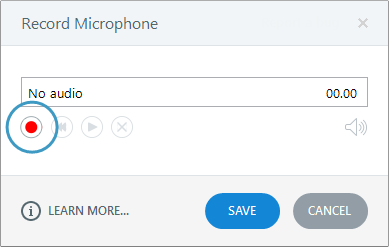 Then single-click the audio icon to stop the audio preview. To hear just part of the audio, use your mouse to select a portion of the waveform. Then use the Play/Pause and Stop buttons, or right-click the selection and select Play. Click the waveform at the point where you want to add audio. The playhead (blue, vertical line) will move to the point on the waveform where you clicked. The Record Microphone window will open. When you're ready to begin recording, click the red Record button. Press Ctrl+X to cut or Ctrl+C to copy. Click Cut or Copy on the ribbon. 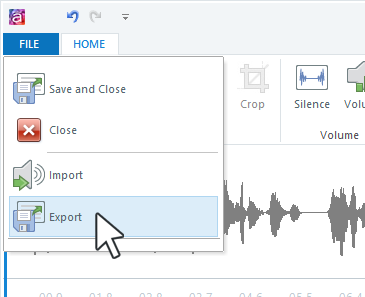 Right-click the selected waveform, and choose Cut or Copy. You can insert silence into your audio waveform to improve phrasing. 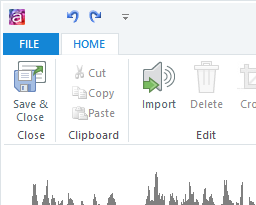 Click the waveform at the point where you want to insert silence, then click Silence on the ribbon. (You can also right-click and choose Insert Silence.) 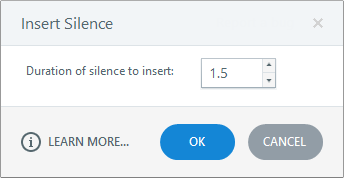 When the Insert Silence window appears, enter the number of seconds of silence you want to add and click OK.
You can change audio volume by clicking Volume on the ribbon and using the slider to make adjustments. If you only need to change the volume for part of the waveform, use your mouse to select that portion of the waveform, click Volume, then use the slider to make adjustments. When you're finished editing your audio, click Save & Close to return to Storyline.